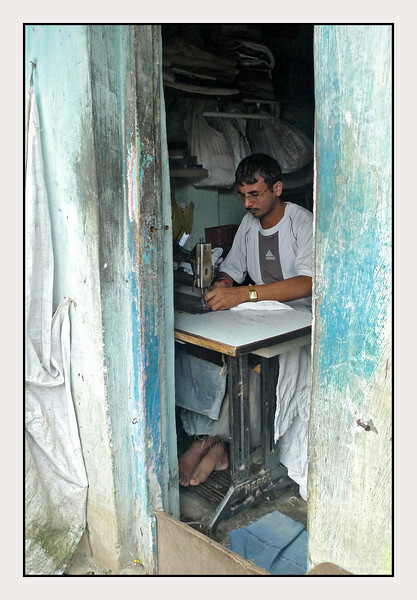 At the Dhobi Ghat in a small shop this tailor was busy with his work. The removable wooden board at the bottom of the door frame is to keep out cats, dogs and water in case of flooding during rains! I usually like B&W, but not too sure this time, the pastel effect is terrific. I think these two are best you've ever shot.. You captured the tranquility of being happy with one's work, just perfectly. Fantastic shot! Super composition... I have a slight preference for the B&W version. Super shot. I really feel like I'm getting a peek into another person's life. This is a really beautiful shot. There is something very tender and interesting about his concentration and simple surroundings. Wonderful image. I love the feeling of getting a peak at something usually more hidden away. I like the color. Great framing on this one. Makes me feel like I'm peeking in. I think the color version would get my vote -- although I do like the b&w one too!